Today we’d like to introduce you to Krista. I’ve been drawn to animals since I was a toddler. I was volunteering in animal shelters the moment I was old enough and I grew up with all sorts of personal animals as well (hamsters, hermit crabs, dogs, cats, a horse, etc. ), I always felt I had a genuine connection with animals and dogs specifically. After college, I was recruited early into a fast-paced sales and marketing position with a large corporation. I quickly climbed the corporate ladder while moving from city to city and I enjoyed the pressures of the job while hitting sales goals, managing people, problem-solving, etc. I moved to Los Angeles after receiving a promotion in 2011. I was only meant to stay here a few years before chasing after another promotion in yet another city, but I met the love of my life and chose to stay and build a life here. I left that large corporation to become the Director of a smaller company launching here in the US. I wanted to gain new experience on a smaller scale where I was able to oversee a Sales Team, an Office Team, a Warehouse Team AND create a market strategy both in the US and the North and South American Markets. My husband, AJ, is a very talented Actor, so Los Angeles is his industry, and therefore our home. We got married, bought a house in the Valley, and adopted the sweetest puppy from the West LA Animal Shelter in 2014. We named her Tica and at the time, she was an adorable 3-month old American Pit Bull Terrier mix with a ton of energy! We were both working long hours back then, so we knew we needed a way for her to get exercise and learn to socialize. 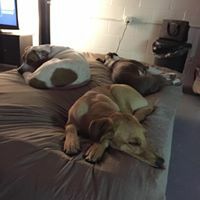 We had some friend recommend using a Dog Daycare. To be completely honest, I am from Texas and raised dogs my entire life. We never needed a “dog daycare” to help us raise our dogs. I thought that concept was hilarious when I moved to LA. But after adopting a new puppy as two working adults, I quickly realized Dog Daycare was the BEST THING EVER!!! It really helped to socialize Tica as a puppy, work out her energy through play all day and it offered a way for her to be supervised during the day while we were working. Total win! Throughout my corporate career, I always felt as though something was missing. I continued to volunteer at shelters and rescue groups on the side but it just wasn’t enough. One of my favorite volunteer jobs was at Adopt & Shop in Culver City. They are a wonderful organization that pulls dogs from local shelters, focuses on their health, helps them learn to socialize, and gets them adopted! I loved creating play groups to help the dogs learn to play and socialize. I have always enjoyed learning about dog behavior and specifically dog “pack” behavior in a group setting. My husband is extremely supportive and always has my happiness in mind. I had lost my spark in corporate sales as it just wasn’t a true passion of mine. I was very successful but I just wasn’t happy. I came to a fork in the road in my career and my husband encouraged me to really consider what would make me happy. He asked me to NOT think about money and determine what would make me truly happy in life. I came up with pursuing my life-long dream and passion of working with rescue dogs and finding them homes. I’d love to create my own rescue group! He said… ‘OK, great!’ Now, put the money back into the equation as we still live in Los Angeles! 🙂 How can we get to that goal while creating a new career? 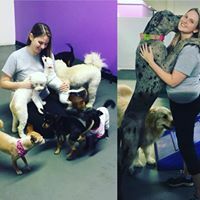 Once the novelty of a Dog Daycare wore off after simply being thrilled someone was looking after Tica every day while we were at work, I started to focus on my experience and knowledge of dog behavior. There are SO many Dog Daycares and Boarding facilities here in Los Angeles and many of them have the same format. I wanted to offer something unique. Something that was built from the ground up with the natural behavior and psychology of a dog in mind. I spent two years researching this industry, consulting with other owners from different markets, studying dog behavior in more detail, and searching for a location. 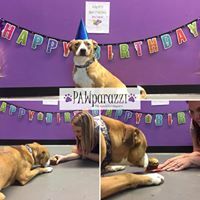 In April of 2016, I opened the doors to PAWparazzi! We are an Overnight Dog Boarding and Dog Daycare facility in Chatsworth, CA. My goal is to create a stress-free environment that genuinely enriches the life of each dog that attends PAWparazzi. This business is very personal as we are caring for people’s “fur babies” while they are in our care. I genuinely aim to earn someone’s trust in hopes of also earning their business. My next goal is to create an additional rescue-based company that ties into PAWparazzi in the very near future! In the meantime, we foster various dogs from the West Valley Animal Shelter and help to find them homes. We also hold various fund-raising events with our incredible PAWparazzi customers to help us sponsor local adoptions and donate resources to the shelter. I’ve never worked so hard in my entire life but I’ve never been happier! I feel like my true passion is now aligned with my true happiness. I absolutely love what I do and my goal is to continue to simply make a positive impact on the lives of my customers, on the lives of their dogs and within the rescue community! Has this been a smooth process? Oh goodness no! But, that is why I appreciate where I am today. The journey has been beautifully difficult but I have learned so much and am grateful for where I am now. Starting a business in Los Angeles is not an easy task! Starting a dog business with strict zoning laws, a large building square footage requirement and a decent start-up capital requirement was also difficult. We scraped pennies together to get this going and I added on and improved little things along the way. My main priority was to build a business that focused on the dog first. Do I have an expensive top-of-the-line million dollar facility… nope. But my facility has been extremely through out, very clean, durable, safe and offers exactly what I set out to create. I’m extremely proud of where we are today and we are aiming to move into a new larger facility within the next year or so! 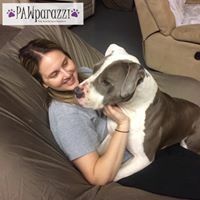 Not only does the name “PAWparazzi” pay homage to my husband’s industry but it is also a way to convey that we treat every dog in our care as a “VIPup” client! 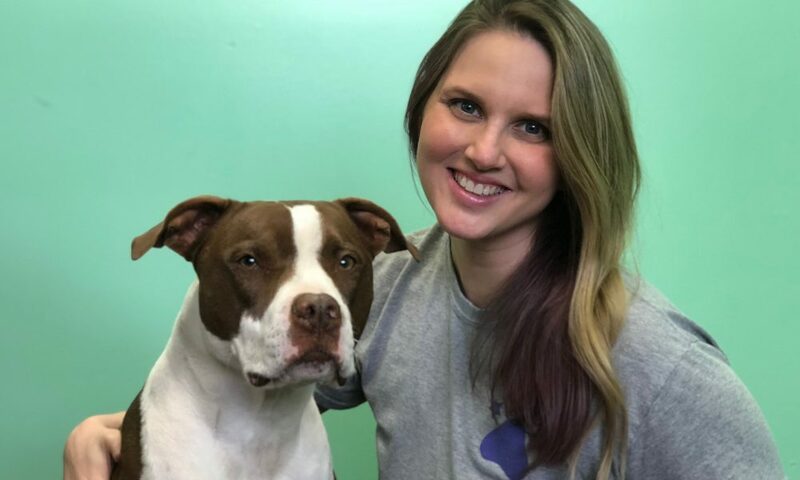 My mission is to genuinely enrich the lives of every dog in my care through providing a clean and safe environment with a structured daily schedule that is optimal for a dog’s well-being. For example, I do not overstimulate the dogs in our Daycare program through keeping them in group play for 12 hours a day. That creates a cranky and unbalanced dog and my job is to focus on the physical and mental health of each dog in my care. We offer group play (as we separate the dogs based on size and play style), we offer both indoor potty areas (to keep up with potty training for puppies) as well as outdoor potty breaks, we engage with the dogs with mentally stimulating training games, puzzles and we even close the facility down from 12pm-2pm each day for nap time and movie time. This is a healthy rest period for the dogs to have lunch, chew on a frozen Kong, and simply rest. And YES… we still send home tired dogs! They are just worn out physically and mentally in the healthiest way possible! 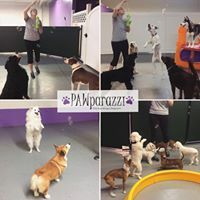 We also act at the “PAWparazzi” and send our customers several picture and video updates throughout the day and this allows our customers to feel connected to us and their dog. I also created an overnight boarding program that is meant to suite the needs of each individual dog based on how they sleep at home. We offer Crate Boarding, Private Suite Boarding, and even Cage-free Boarding (think of a dog slumber party). We also partner with Karma Dog Training and offer Puppy Training Classes on Sundays! 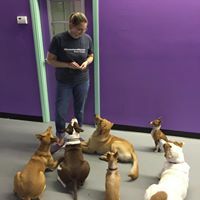 It’s a wonderful class that includes training exercises and off-leash puppy parties so the puppy can learn to play appropriately. 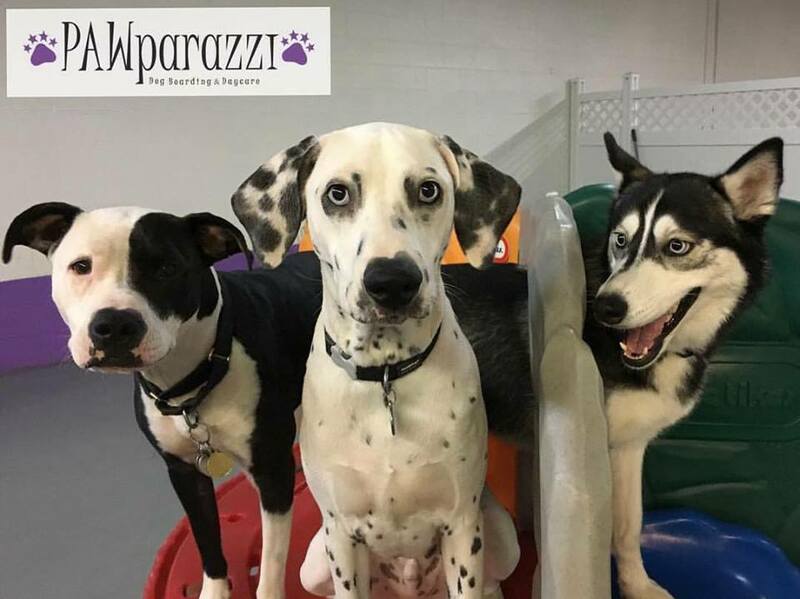 The graduates of this class often enroll in our daycare program to continue their puppy’s socialization and to provide them with a higher level of care through our unique daily Daycare schedule at PAWparazzi. I had an awesome childhood playing sports and always being involved with animals. My parents saw my passion for animals early on, so they always provided me ways to explore that passion (adopting animals, taking horseback riding lessons, volunteering at local shelters or rescue groups, attending specialized camps, etc.). Thanks, Mom and Dad!! I have a super goofy sense of humor! I love to laugh and make others laugh. My parents always said I started making them laugh at the dinner table ever since I was a young child. I’ve always just loved to have a good time. My competitive drive enables me to work hard but my goofy and personable side allows me to connect with people in a natural way. I always want people to feel comfortable and happy when they are around me. I originally wanted to be a Marine Biologist. I wanted to learn how to train Dolphins in a way that could be used for therapy sessions for special needs children. I’ve always been fascinated with the psychology of Dolphins and their physical and mental capabilities. Although becoming a Marine Biologist didn’t pan out, I am still a certified Scuba Diver and LOVE respectfully exploring the beautiful world within our oceans. It’s an expensive hobby that I don’t get to enjoy too much these days since starting my own business but I can’t wait to dive again (hopefully soon!). I started playing basketball when I was 7 years old. I went on to play on competitive traveling teams throughout high school and I was even honored to play on a USA team oversees in Germany, Holland, Belgium and Australia. Playing basketball at that level truly instilled in me an appreciation for teamwork. Today, when interviewing and recruiting new employees, I always emphasize that we are a TEAM at PAWparazzi!